It is not possible to detect simultaneously human and animal eyes. Eye detection may not be possible depending on the environment, animal type or the movement of the animal. This may also cause abnormalities in the files managing the images, preventing the images from displaying on the camera. 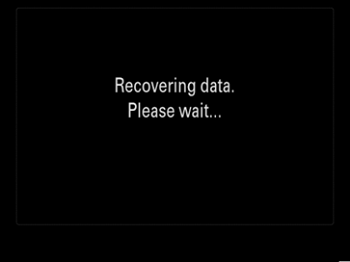 No image data in the memory card will be corrupted or deleted aside from the data that was being written at the time the interruption occurred. Optimization of the optical image stabilization performance, and addition of a new image stabilization mode of the lens (Mode 3)(Only "SEL400F28GM"). *Using the lens "SEL400F28GM" or "SEL24F14GM", when [Silent priority] is selected, the sound emitted by the aperture drive will be reduced. This is useful in shooting conditions where camera. noise should be kept to a minimum. Note that Auto Focus may become slower when [Silent priority] is selected. When used with the LA-EA3 mount adaptor, all focus areas are supported. Note : Focus Area options added : Zone, Expand Flexible Spot, and Lock-on AF. Bracket shooting is available during silent shooting when [File Format] is set to [RAW] or [RAW & JPEG] and [RAW File Type] is set to [Uncompressed]. Power source for the device. Fully charged rechargeable battery pack NP-FZ100. Use a fully charged rechargeable battery pack (NP-FZ100). The system software update will take approximately 10 minutes. Please do not allow your computer to go into Sleep mode during this time. If the computer does go into Sleep mode and the update is interrupted, the entire update process will need to be restarted. 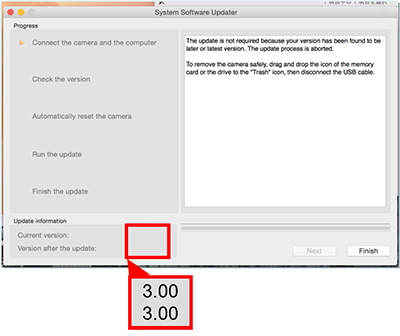 Do not open "About This System Software Updater" in the System Software Updater menu as this may cause the Updater software to crash. The [Update_ILCE7M3V300.dmg] file will start downloading. Close all currently programs currently running on your computer. Once the message from the system displays, the security and privacy screen will be displayed. 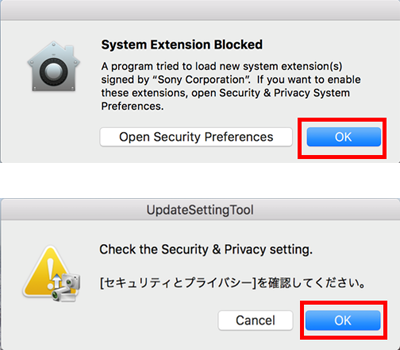 Open the "General" tab on the "Security and Privacy" screen and allow reading of the "Sony Corporation" system software. Note: If you have approved this in the past, the security and privacy screen will not be displayed. 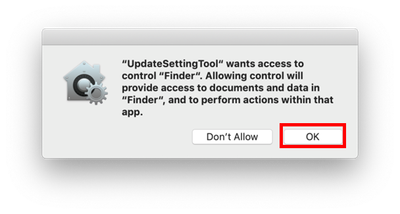 If you are asked to restart macOS after clicking the [Allow] button, please restart and return to the beginning of the update procedure. If the "Security and Privacy" screens does not disappear, please close the window. 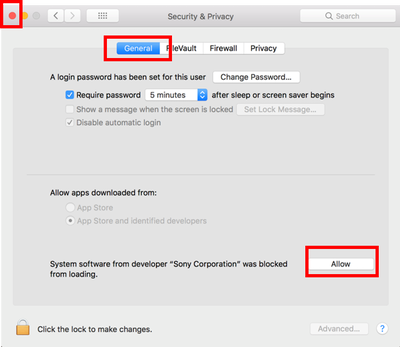 If both the message displayed and the "Security and Privacy" screen do not disappear, close both using the [OK] button. A dialogue box for the USB connection will be displayed. Connect the camera to the PC using the USB cable (supplied). 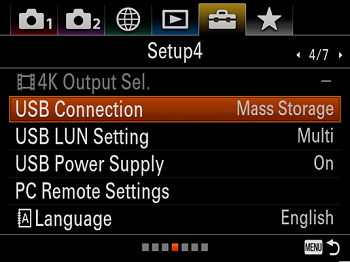 "USB Mode" appears on the LCD monitor of the camera. Click [OK].If the message is displayed, close using the [OK] button. 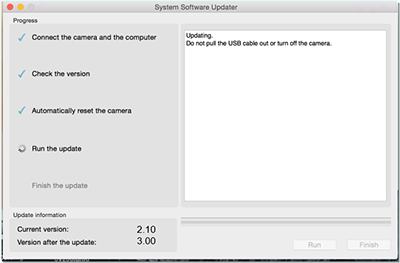 The System Software Updater will start. Note: If the System Software Updater does not start up, double-click [System Software Updater] in the [Update_ILCE7M3V300] - [Resources] folder to start up. 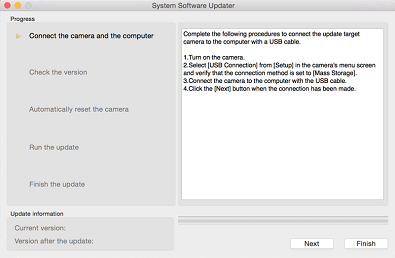 Following the instructions in the System Software Updater window, on the camera, select Menu > Setup subpage  > USB Connection and check if Mass Storage has been selected.If a mode other than Mass Storage is selected, please select Mass Storage. Sometimes, when the camera is connected to the computer with the USB cable, a message prompting you to restart the computer may be displayed. If this happens, remove the battery pack from the camera, reboot the computer and follow the instructions from "2. Start the System Software Updater". Click [Next]. 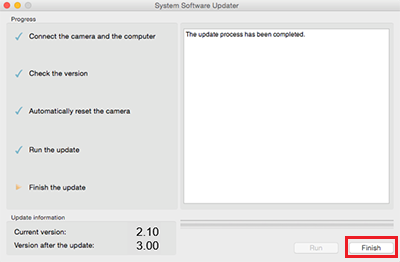 The current version number and updated version number appear on the lower left-hand side of the screen.After confirming that the current software version is "Ver. 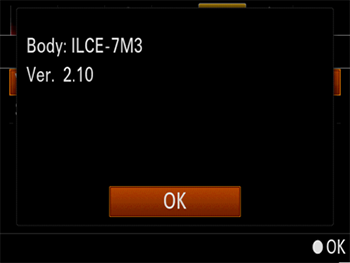 2.10 or earlier", click Next. 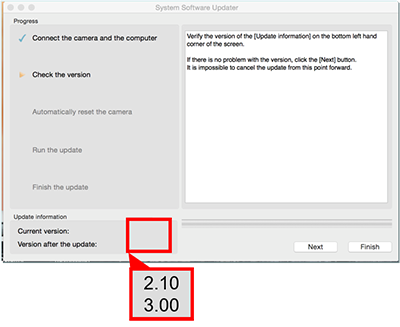 If the current system software version is 3.00 or later, the update is not required.In this case, disconnect the camera from the computer and click Finish. Turn off the camera, remove the battery pack, reinsert the battery and turn the camera back on. The camera will automatically be reset. The screen below will be displayed. 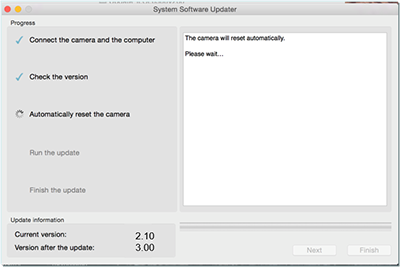 Once the update has been completed, the camera will automatically restart. Make sure that the camera is turned on and wait until the LCD screen appears again.Click Finish when the LCD screen appears and disconnect the USB cable. 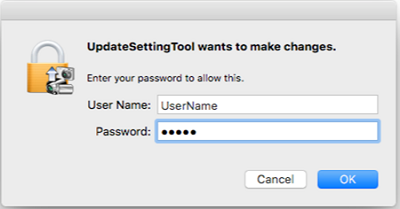 Step 2: Confirm that the system software version of your device is Ver. 3.00.